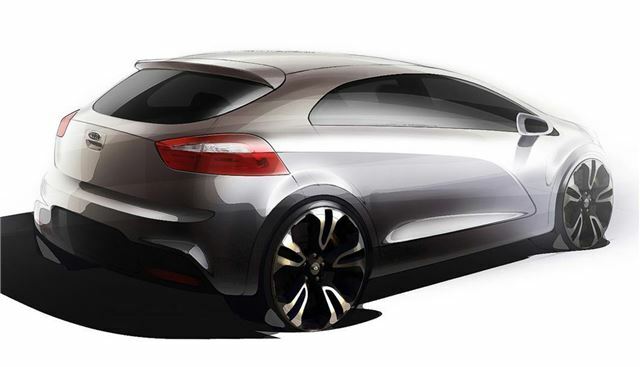 Kia has revealed the first official sketches of the next generation Rio which will go on sale in the UK as a five-door in September 2011 with a more sporty three-door due to follow in early 2012. It will be unveiled at the Geneva Motor Show in March. Described by Kia as 'sporty and elegant' the new model marks the 'next big step' in the company's designs. The new Rio is longer, lower and wider than the outgoing model and has been designed to appeal to a younger audience who want a more stand-out look. Inside the cabin Hyundai is promising the sort of quality you'd expect in larger and more expensive cars. It will be powered by updated versions of the 1.4-litre petrol and 1.5-litre diesel engines used in the current Rio plus there's likely to be a 1.2-litre petrol with a turbocharger which should blend good performance with high economy and low CO2 emissions. The new Kia Rio will make its global debut at the Geneva Motor Show in March 2011 and it has some big shoes to fill. The current Kia Rio was the company's third best-selling vehicle in overseas markets during 2010 with sales of more than 205,000 cars.